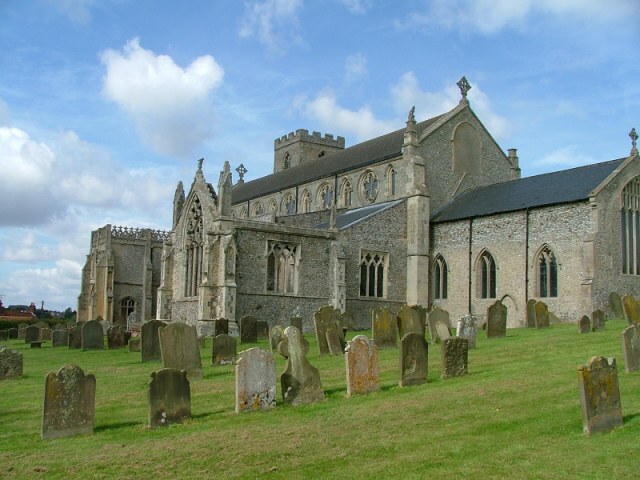 It is repetitious to observe that East Anglia was the industrial heartland of late medieval England, or that this nation was a devout Catholic country at the time, or even that the collision of these two facts resulted in some of the most spendid church architecture in Europe. Virtually every parish church in the land bears some evidence of this, but it is particularly obvious in the centres of power of those times: at Lavenham in Suffolk, where the great wool merchants held court, at Salle and East Harling in Norfolk, where great landed families competed to influence the crown, and here at Cley, once at the harbour mouth of Blakeney Haven, the great north Norfolk conurbation of ports, where the streets thronged with wealthy merchants and their workers. Today, the harbour is lost to us, but you can still make out its shape if you stand in Wiveton churchyard and look back across to Cley, half a mile off. At Blakeney itself, the quayside survives with some of its buildings to help a reconstruction in the mind; but Cley has nothing now except its church and a few cottages, a village green and a windmill. Ironically, you wouldn't even know that the sea was close. Of the four churches of Blakeney Haven, St Margaret was the biggest, grandest and most expensive. It is still all of these things today. It is replete with all those elements we find most exciting when we visit a medieval East Anglian church: a seven sacrament font, bench ends depicting people and mythical creatures, brasses, bosses, stalls and the most elaborate niches in the kingdom, a smattering of old glass, and stunning tracery that, being Decorated rather than Perpendicular, is unfamiliar in East Anglia. We have explored elsewhere on this site, in the introduction to Salle and Cawston, exactly why these churches were built so large and elaborate. Well, St Margaret is another stunning testimony. The setting is lovely, on a gentle rise above the village green. The graveyard is scattered, many of the stones 18th century, and not lined up in clinical rows by misguided 1970s lawn-mower enthusiasts. If you come in late spring the graveyard is uncut, full of wild flowers and tall grasses, but in this September morning it was neat and trim, a velvet mount for the church. What you see is, at first sight, complex. The vast nave with its aisles and clerestory is all of a piece. The offset tower is rather mean, and although it seems likely it was intended for rebuilding, the huge and beautiful west window suggests that it would have been in the same place. The chancel is also curiously simple, and eventually would have been replaced. Two transepts stick out to north and south, the southern one roofless and glassless, that to the north entirely ruinous. The merchant de Vaux family were responsible for rebuilding the church, and the new nave was built to the south of the original nave, which was then demolished and replaced with an aisle. You can still see its roofline on the east face of the tower. The master mason was WIlliam Ramsey, one of the most significant in England; the Ramsey family were responsible for the Palace of Westminster and parts of Norwich Cathedral. Work began in the 1320s, and proceeded quickly until the building was pretty well complete by the mid-1340s. This is an early date for the complete rebuilding of an East Anglian church, and shows that here, in Blakeney Haven, the new money was early. It would not be for a hundred years that Suffolk and south Norfolk families were in a position to do the same. Why was this? Partly, the wealth of the Blakeney Haven ports did not depend just on East Anglian cloth. But there was another, more apocalyptic factor. Before Ramsey could turn his attention to the chancel and the problem of that blessed tower, a new and frightening pestilence reached England. For anyone living in a port, diseases brought from abroad were an everyday hazard that had to be balanced against full employment and opportunities for wealth creation. Even so, this was something on a spectacular scale, a strain of bubonic plague that reached the south coast ports in August 1348 and that by the dismal late winter months of 1349 had reached Norfolk. Perhaps half the population died, although in the ports there seems to have been a higher survival rate; perhaps there was more immunity due to previous exposure. However, Ramsey and his son both died, and the work of the ports was disrupted for several generations. The Victorians, relishing the gothic horror of the disaster, looked back from their own cholera-plagued century and called it the Black Death. Half a century later, trade, confidence, and a renewed obsession with the cult of the dead led to more money being lavished on St Margaret. This was the time that the mighty south porch was built, a Perpendicular fortress that guards, rather uneasily, the Decorated entrance. The church was further furnished with a mighty rood screen, elaborately carved woodwork, and glass and a seven sacrament font intended to assert the official doctrine of the Catholic Church. By the early sixteenth century, Cley church was at a peak of its glory, but very quickly those times were to tumble. The English Reformation brought to an abrupt end the need for bequests, and all work on developing the building stopped. And, state protestantism would sow the seeds that would help England emerge as an insular, capitalist nation, changing patterns of trade, and doing away with the need for Blakeney Haven, pushing Norfolk back into the relief of a long, agricultural sleep. So, you take a walk around the outside of St Margaret, the window tracery a text book of the way English architecture developed over the centuries. The most beautiful is that in the south transept, elegant lights that build to a cluster of vast quatrefoils. This was competed on the eve of the Black Death, and is probably at the very apex of English artistic endeavour. But I think that it was never filled with glass. I can see no evidence that the transepts were completed in time for their use before the pestilence, or that there was ever a need to use them after the recovery from it. And, then, of course, the Reformation intervened. You step into the church through the south porch, with its flanking shields of the Holy Trinity and the Instruments of the passion. Above, in the vaulting, are bosses. One shows an angry woman chasing a fox that has stolen her magnificent cockerel. Another, curiously, shows a man and a woman beating the bare buttocks of a third figure. There is also an Assumption - you can see all of these below. Grand Perpendicular is so common in East Anglia that there is an unfamiliarity about the nave that is breathtaking, a feast for the senses. The west end of the church has been cleared, creating a cathedral-vastness, and the light, while not gloomy, does not have that white East Anglian quality familar from Perpendicular buildings. The smell is of age rather than furniture polish, a creamy dampness that recalls former business rather than decay. The honeyed stone is also somehow foreign in this heartland of flint. It affects the sound in a different way. The building demands a certain amount of awe that is not just due to its size. We arrived about an hour before a wedding was due to start, and as we explored the building we saw preparations build, the pews begin to fill, the minister and choir begin to robe, until we felt we were intruding, and left just as the bride arrived. But while I was not completely distracted from documenting the building, it was a reminder to me just how important weddings have become to the Church of England, not just in terms of the income they generate, but as a last bastion of the grounding of Faith in ordinary people's lives. They may no longer have their children baptised, they may no longer come on a Sunday at all; but marriage is the place that simple Christianity touches their lives - that, and their funeral, of course, although increasingly people are more militantly aetheist about death than they are about love. The seven sacrament font looks rather lonely in its clearing, and is not the most spectacular of its kind, although the imagery is a little unusual. The Last Rites, (NW) appear to show the Priest lying on the bed on top of the dying man. Confession (NE) shows the Priest and confessing man facing each other across a shriving bench. Confirmation (E) is the most compelling of all, because it appears to show a tonsured Priest rather than a bishop blessing a group of people that include children and babies. Mass (SW) is shown from behind, the Priest elevating the host while the acolytes on either side kneel and hold tapers. The eighth panel is lost, but was probably the Crucifixion. The most spectacularly un-East Anglian feature of the church are the great image niches that line the arcades. They are huge. Beneath the pedestals are depicted figures, including musicians (one plays a fife and drum), St George dispatching a dragon and a fearsome lion with a bone. There are traces of original colour, and they are simply spectacular. More homely are the bench ends, including a beautiful mermaid, several figures reading books, and a poppyhead carved with a face sticking out its tongue, of a type sometimes called Scandal, although I have never been convinced by this. There are many brasses, some in the north aisle and others scattered around the south door, including one stunning fragment depicting a group of six weepers. In the north aisle is a fascinating collection of donated and collected ephemera, some suggesting that in the recent past this was a fairly Anglo-catholic place, including a beautiful Russian Orthodox cross. I rushed around taking photographs while the church filled with wedding guests. And so, it was time to go. I decided that I was impressed by this church, but that I didn't love it. Looking around at the splendour of William Ramsey's work, at what survives of its elaborate furnishings, and sensing the echoes of the rich sacramental life it once hosted, I had a sudden vision of apocalypse - not of the Black Death so much, as of the end of a way of life replaced by something so wholly different in a few short years of Reformation. This church had been built for so much more than congregational worship, but this was all it could now do; as if the Anglican community was camped out uneasily in its ruins, in the vastness of something so wholly beyond their imagination.